I didn't know what to expect when one of my favorite fiction writers published a memoir, but I found myself enjoying this book even more than Keret's fantastic short stories. He deals with becoming a father, losing a father, life as a writer/self-described "ambi-Israel" Israeli, as well as a very big lizard. Through all this, Keret never loses his sense of humor & wonderment. 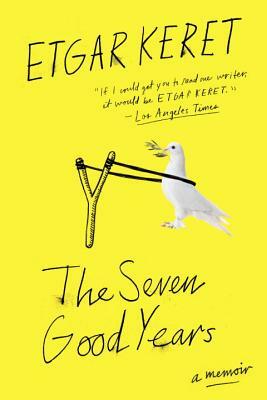 A brilliant, life-affirming, and hilarious memoir from a “genius” (The New York Times) and master storyteller. With illustrations by Jason Polan. What emerges from this dark reality is a series of sublimely absurd ruminations on everything from Etgar’s three-year-old son’s impending military service to the terrorist mind-set behind Angry Birds. There’s Lev’s insistence that he is a cat, releasing him from any human responsibilities or rules. Etgar’s siblings, all very different people who have chosen radically divergent paths in life, come together after his father’s shivah to experience the grief and love that tie a family together forever. This wise, witty memoir—Etgar’s first nonfiction book published in America, and told in his inimitable style—is full of wonder and life and love, poignant insights, and irrepressible humor. Etgar Keret was born in Ramat Gan and now lives in Tel Aviv. A winner of the French Chevalier des Arts et des Lettres, he is a lecturer at Ben-Gurion University of the Negev and the author, most recently, of the memoir The Seven Good Years and story collections like The Bus Driver Who Wanted To Be God. His work has been translated into thirty-seven languages and has appeared in The New Yorker, The Wall Street Journal, The Paris Review, and The New York Times, among many other publications, and on This American Life, where he is a regular contributor.